To support aquatic life, it is essential to remove both ammonia and accumulated debris. The most efficient way to accomplish this is by installing professional grade filter. Patented media supports bacterial growth while backwash systems separate the waste from the media sending it out the waste line. These systems are designed to run with external pumps and ponds with high fish loads. Combines both biological and mechanical filtration in one compact body. Simply by rotating the valve the patented cyclonic backwash system does the dirty work for you. In just minutes the internal jets clean the filter for you. Ultima II Filters are designed for high flow rates, extreme fish loads, and elevated feed rates. 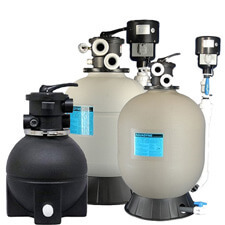 These professional grade filters come standard with an Air Backwash system. Available in a variety of popular sizes filtering environments from 2,000 gallons all the way up to 30,000 gallons. Evolution Aqua are the number one manufacturer of Koi and pond filtration equipment. Offering multi-award winning filter systems - Nexus, Micro Bead, Eazy Pod and Automatic self cleaning Eazy Pod Filters.